8 January 2015, at 9:25a.m. US - Everyone in the hog industry needs to take a big dose of reality: 2015 will not be as good as 2014, writes Steve Meyer. The good news is that 2015 will still be a good year; at least from a financial standpoint. Finances aren’t everything, of course, and there could be many, many factors that make this your best year ever. Don’t forget them. In fact, focus on them because family, friends, community and spiritual matters are the real stuff of which life is made. 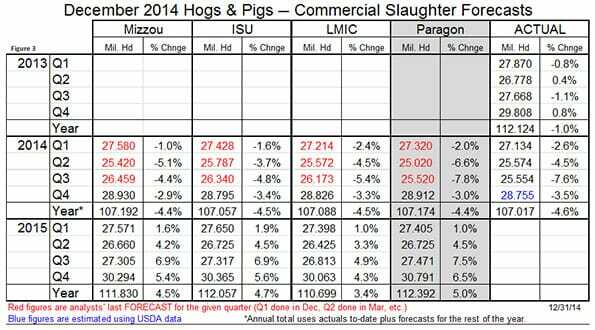 The US Department of Agriculture’s December 'Hogs and Pigs' report is clear on one thing: expansion is occurring and hog numbers, barring a huge reversal in porcine epidemic diarrhoea (PED) virus (PEDV) and porcine reproductive and respiratory syndrome (PRRS) fortunes so far this winter, are going to grow substantially in 2015. The key numbers from the report are in Figure 1. The numbers were much as expected. 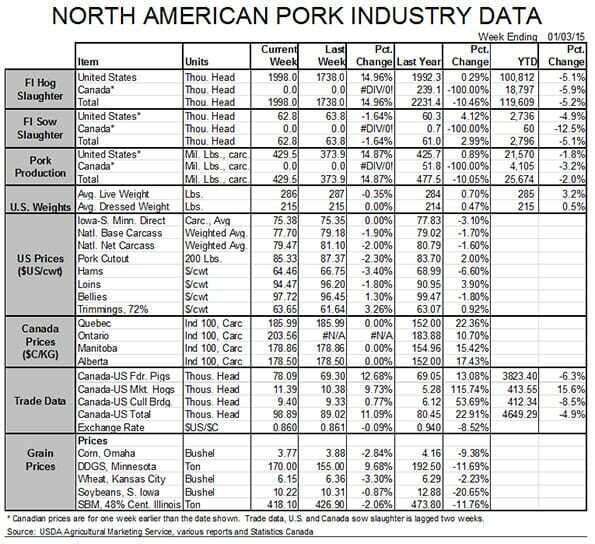 Only the inventories of pigs over 120 pounds were more than one per cent higher than expected – and those are a bit in question as December slaughter has lagged the USDA number by about one per cent. All of the others were within 1 per cent of pre-report estimates. Now those estimates aren’t always reasonable. Such was the case in March and June, when all of us were guessing about PEDV. But these averages made a lot of sense given market conditions. Futures markets have found the numbers favorable with summer contracts rallying about $3 over the past two holiday- interrupted trading weeks. The 3.7 per cent increase in the breeding herd is the largest since – March 1998. We all remember that year! But we need to keep this in perspective. First, this increase is coming off the smallest herd on record one year ago. It also results in a herd that is well within the norms of the past few years, not one that broke a significant trend as the 1997 and 1998 growth did. Farrowing intentions for the next two quarters are large but, if anything, are low relative to the breeding herd. That is based on historical relationships but we think these numbers are reasonable given what we hear about breeding/farrowing rate challenges in herds that have had PEDV. Things are better but not back to normal on many of those farms. The numbers do not answer the most critical question: What about litter sizes in 2015? 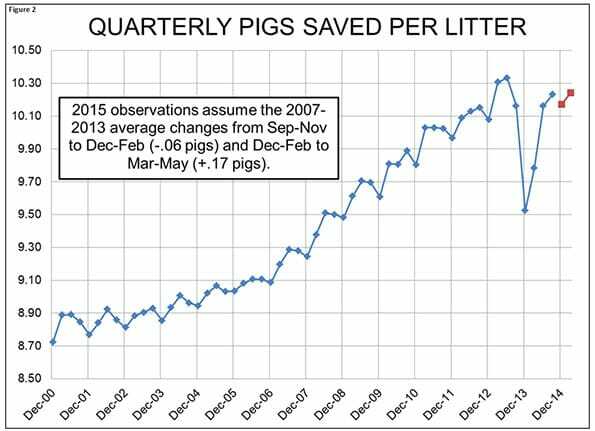 The September-to-November pigs saved per litter of 10.23 was 0.7 per cent higher than last year’s. That number was impacted some by PEDV but the big brunt of the virus hit in December to February and March to May of last year. 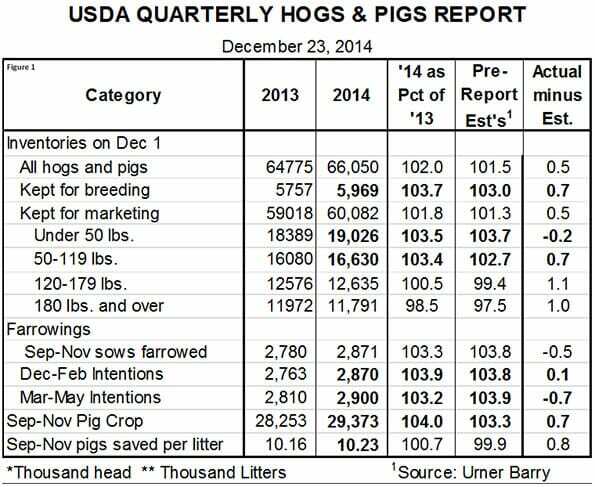 We know of no one who thinks we are either going back to 2013 or staying at 2014 litter size levels these next two quarters but the historical relationships are that December to February litters are 0.06 pigs smaller than September to November and March to May litters are 0.17 pigs larger than December to February litters. If those changes hold, litters the next two quarters would be up 6.8 per cent and 4.7 per cent, respectively, from last year’s levels and would result in pig number increases of more than 10 per cent and 8 per cent in the third quarter and fourth quarter. Those are shocking numbers – which I don’t think will happen because PEDV has not gone away and there are some indications that PRRS is worse this year. I am using two-thirds of the normal litter size changes in my forecasts (see Figure 2) and still get hefty supply increase in the second half of the year. The author has 2015 slaughter up five per cent from 2014 with the largest portion of that increase coming in the third and fourth quarters (see Figure 3). He says he is pretty much in line with his normal benchmarking group though the staff and the Livestock Marketing Information Center expect somewhat smaller increases. Though the quarterly pathways differ somewhat, all four end up at about the same spot for the year with prices averaging in the mid-$80s on a carcass weight basis. See Figure 4. 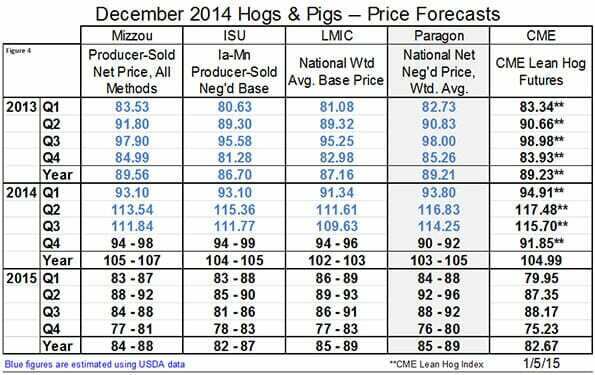 Lean Hogs futures are generally lower than the forecast levels with the exception of the third quarter at present. As always, you need to make your pricing decisions based on the profit margins being offered and your ability/comfort regarding risk. Many of you have strong balance sheets that can allow you to take some risk this year. Some still do not. The average margin in our Iowa State University-based model is just over $20 per head as of mid-day on 5 January. Only three years (2004, 2005 and 2014) saw better profit margins since 1990. 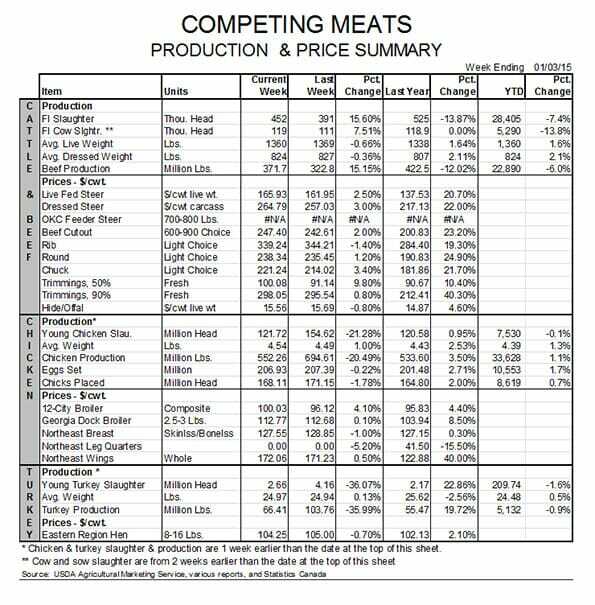 There could be some upside in hog prices if demand remains strong and supplies play out as indicated in this report – but not a lot of upside. There is some down side to feed ingredient prices when the record crop of 2015 begins to move in the spring – but not a lot of downside. You must, as always, weigh these probabilities in the context of your business and your skills.